The road plunged down, then up, then down as far as the eye could see, through a vast sea of trees. We looked at each other asking, "Who would ever live there?" It would be us. 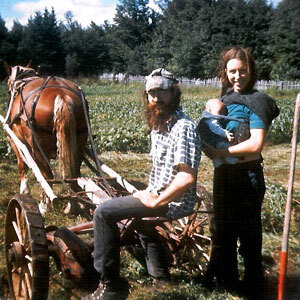 A long time ago, when we were young and in love, we moved up here to a remote land with no buildings, electricity, telephone, or near neghbors. We didn't speak French or have farming skills. We grew our food with the help of good old Danny. Our staple protein source was soup peas, which thrive in this cold climate. From May to December for our first four years here, we lived in this tipi that we had made. We cooked over an open wood fire. 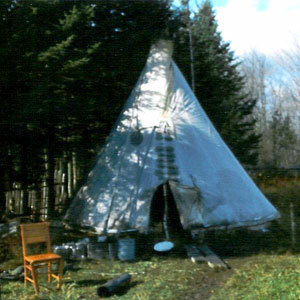 The smokeflaps kept the rain off the fire, and the tipi liner provided a good draft for the smoke. A tipi has a special beauty under the moon and during lightning storms. 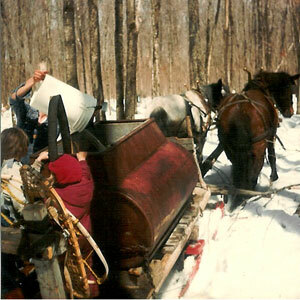 The horses, Partner and Maude, know the woods roads and move up to us as we fill our collecting buckets with sap. Whooa! We dumps the sap into the collecting tank. Behind us in the newly-emptied buckets, the sap dripping drums out the rhythm of early spring. Anna Spring and Abraham hang on to the tank. Steam from the boiling syrup pours out the steam stack, wafting the delicious maple aroma skyward. 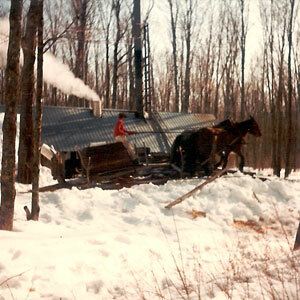 The horses pull the sap collecting tank up the ramp to be dumped into a storage tank and boiled. We built our first sugar cabin in our second winter here.